Dividend kings are stocks that have grown their dividends for at least 50 consecutive years. You can see the full list of all 25 Dividend Kings here. Therefore, as the earnings of cyclical companies tend to collapse during economic downturns, it is really rare to see a cyclical stock qualify in this group. Nevertheless, Dover Corp. (DOV) is a bright exception to this rule, as it has raised its dividend for 62 consecutive years. Even better, the company is firing on all cylinders right now. Dover was severely affected by the downturn of the oil market in 2016. As the price of oil collapsed, most oil producers drastically curtailed their activities. Consequently, the contribution of the energy segment to the total revenues of the company plunged from 26% in 2014 to 16% in 2016. The trend was much more dramatic in the contribution of this segment to the total earnings, which collapsed from 34% in 2014 to 6% in 2016. Fortunately for Dover, the price of oil has enjoyed a strong rebound since last summer thanks to the production cuts of OPEC and Russia. As a result, U.S. crude oil production grew 1.2 M barrels/day last year and reached its highest level in history, surpassing the hallmark of 10 M barrels/day. Even better, the Energy Information Administration projects that the output will continue to grow in 2018 and 2019, to an average level of 10.7 M and 11.3 M barrels/day, respectively. Therefore, the energy segment of Dover is experiencing tremendous growth, with ample room for further growth. To be sure, during the last quarter, this segment posted organic revenue growth of 23% and an 18% increase in its bookings. While the energy business of Dover is enjoying an impressive recovery, the traumatic experience from the recent downturn led the management to decide to spin off this segment. In this way, Dover will greatly reduce its cyclical nature while the spin-off company will be an ideal holding for those who seek direct exposure to the upstream energy business. Moreover, thanks to the strong rebound of this segment, the timing of the spin-off could not be better. As per the latest guidance of the management, the spin-off is expected to materialize in May. Apart from the energy segment, the other segments grew at remarkable rates last year. The segment of engineered systems, which is the largest segment, enjoyed 6% organic revenue growth last year. Within this segment, the digital textile printing is growing at a fast pace and has plenty of growth ahead. More precisely, the management believes that it can grow the penetration of this business from its current 3%-5% rate to 30% over the next decade. This is certainly exciting. 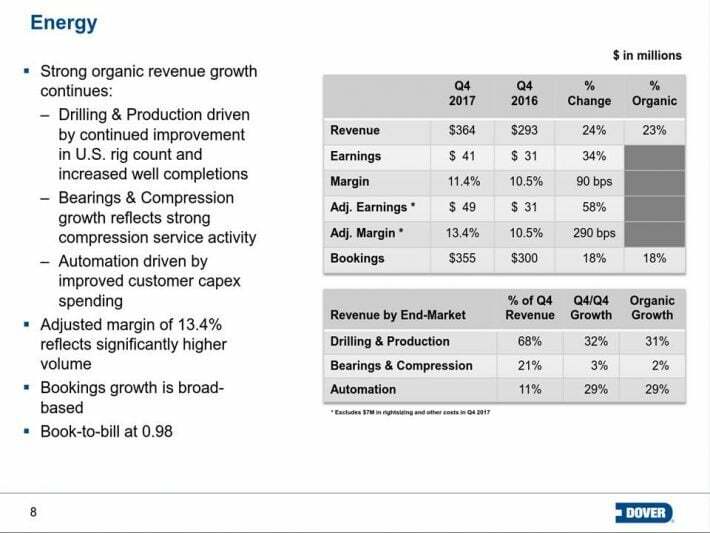 Overall, the management expects to achieve 19% growth in the earnings per share [EPS] this year, from $4.89 to $5.73-$5.93. Significant growth is expected both in the domestic market and in China. These growth prospects are definitely sufficient to satisfy even the most demanding shareholders. At first sight, Dover is a manufacturer of industrial equipment and hence there seems to be little potential for differentiation in its business. As a result, it would be natural to assume that the company does not have meaningful competitive advantages. However, the exceptional growth record of the company indicates that it actually has some competitive advantages. During the last four years, Dover has spent $3.0 B on a long series of relatively small bolt-on acquisitions. Thanks to these acquisitions, the company has built up a diversified portfolio of products that are intended for highly profitable market niches. More importantly, the company does its best to offer comprehensive solutions to its customers. Thanks to the efficiency and the economies of scale of such solutions, many customers engage with a long-term relationship with Dover. In this way, Dover enhances, not only its current sales, but also its potential for future growth opportunities. Still, Dover grew earnings from 2007 to 2010. Moreover, Dover manages to spend low amounts on capital expenses compared to its operating cash flows. As a result, it has enjoyed strong free cash flows every single year in the last decade. Even in the Great Recession, it enjoyed free cash flows of $676 M or $3.62 per share. Moreover, its net debt (as per Buffett, net debt = total liabilities – cash – receivables) is $4.1 B, which is only 5 times its annual earnings. The strong free cash flows and the healthy balance sheet are testaments to the strength of the business model and confirm that the company can easily continue to raise its dividend at a meaningful pace for years. During the last five years, the company has grown its dividend at an average annual rate of 6.0%. ValueLine analysts expect Dover to generate earnings-per-share of $5.00 in 2018, which means the stock trades for a price-to-earnings ratio of 19.7. While this valuation is cheaper than that of S&P, investors should keep in mind that a recession has not shown up for nine years in a row. Investors should keep this risk factor in mind, particularly amid rising interest rates. Moreover, according to ValueLine data, Dover has traded at an average P/E ratio of 16.2 during the last decade. Therefore, the stock is not particularly cheap at the moment. The management of the company targets 3%-5% long-term revenue growth. In addition, the stock currently offers a 2% dividend yield and the company has repurchased its shares at a 1.5% average annual rate during the last decade. Therefore, if we assume no margin expansion for the sake of safety, the stock is likely to offer average annual returns of 7%-8% going forward, as long as a recession does not show up. On the other hand, in the event of a recession, the stock is likely to incur steep contraction of its P/E ratio, which will largely offset the above growth. Dover has raised its dividend for 62 consecutive years. This is an exceptional achievement, particularly for a cyclical industrial stock. The vast majority of cyclicals see their earnings collapse during economic downturns and hence they cannot keep raising their dividends for decades. However, thanks to its above analyzed business model, Dover has maintained its exceptional dividend growth streak quite easily. To be sure, its payout ratio currently stands at 35%. As this ratio is markedly low, it leaves ample room to the company to keep growing its dividend for many more years. Dover is one of the very few cyclical companies that have managed to become dividend kings. In addition, now that the fierce downturn of the oil market has come to an end, Dover is firing on all cylinders, with meaningful growth in all the segments. Therefore, given its exciting growth prospects and its strong financial position, the stock is likely to continue to offer great returns in the absence of a recession. Nevertheless, as the U.S. economy has run for nine consecutive years without a recession, investors should be aware of the downside risk in such an event.